This week’s “Bird of the Week” is the Ruddy Duck (Oxyura jamaicensis), is an odd little diver, and the main North American representative of the group of stiff-tailed ducks, with spiky tail feathers that are often cocked up in the air. They are usually lethargic, and seem reluctant to fly. On takeoff they must patter across the surface of the water to become airborne, then whir along on rapidly beating wings. On land they are almost helpless. Flocks of Ruddies wintering on lakes seldom mix freely with other ducks, although they may associate with American Coots. apparently much lower than historical levels, owing to unrestricted shooting early in the 20th century and to loss of nesting habitat. Habitat is on fresh marshes, ponds, and lakes; and in winter, on salt bays. Breeding is on fresh or alkaline lakes and ponds with extensive marshy borders and with areas of open water. In winter, habitat is on protected shallow bays and estuaries along the coast; and also on ice-free lakes and ponds in the interior, including those with little or no marshy border. Foraging is done by diving and swimming underwater, propelled by feet, using its bill to strain food items from mud at the bottom of ponds. They rarely forage by dabbling at the surface. Diet is mostly seeds, roots, and insects. They feed on the seeds and roots of plants including pondweeds, sedges, smartweeds, coontail, and grasses. They also eat aquatic insects, mollusks, crustaceans, and rarely small fish. Insects and their larvae may be the main foods eaten in summer. After mating, females lay 5-10, typically 8, whitish, becoming nest-stained, with rough, granular surface, and quite large for size of bird eggs. Ruddies often lay eggs in each others' nests and in those of other ducks and marsh birds. Incubation is by females, in about 23-26 days. Young leave their nests within a day after hatching, and are able to swim and dive well immediately. Young are tended by females, but feed themselves. Age at first flight is about 6 weeks. 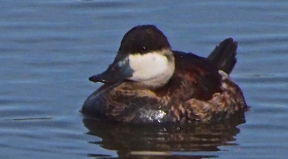 Ruddy ducks yield one brood per year in the north, and sometimes 2 in south. Pairs form after arrival on breeding waters. Courtship displays of males include raising tails over their backs and bouncing their heads rapidly so that their bills slap against their chests; and short rushes across water with much splashing of wings and feet. Nest sites are in dense marsh vegetation over shallow water. Nests (built by females) are a woven platform of grasses, and cattails, lined with down, a few inches above water and anchored to standing marsh growth. Nests are sometimes built on top of old muskrat houses or coot nests. Winter is the time to spot these small, compact ducks with stout, scoop-shaped bills, and long stiff tails often held cocked upward in the Tijuana Estuary. Look for this species, and the other great birds that call the Tijuana Estuary their home. Until next week, happy birding!